Flamingos are wading birds and belong to the genus Phoenicopterus, which only consists in 6 species all over the world: 4 in the Americas and 2 in the Old World - Europe, Asia and Africa. They are graceful birds, until 1.40 m height with long legs and long necks. Feet have 4 toes and when flying, both neck and legs are completely straight. Their beak is a wonderful specialized tool to catch in the muddy water the animals they feed on. The superior jaw is mobile and the curvature of the beak allows the flamingo to hold the foodstuffs thanks to some tiny laminae. But what is characteristic of flamingos is their beautiful colour, from salmon (Caribbean flamingo - Phoenicopterus ruber) to withish pink (European flamingo - Phoenicopterus roseus). 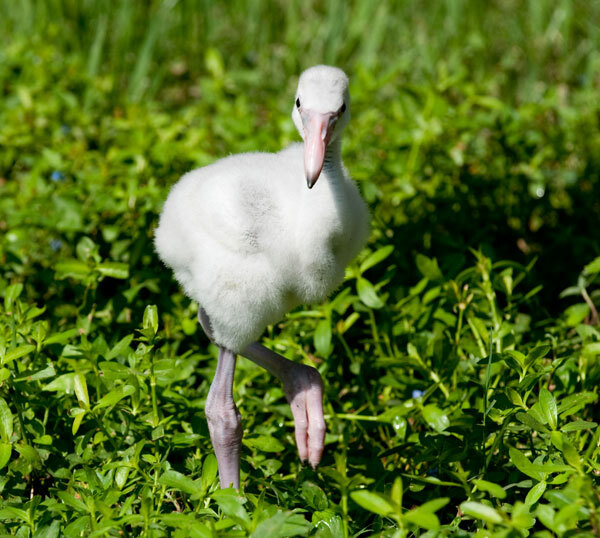 However, the flamingos are not always pink: at birth they are grey! This distictive colour is due to their diet. Flamingos filtered the muddy water with the beak and swallow algae and small crustaceans such as Artemia salina, a brine shrimp full of carotenoid - organic pigments. Enzimes in the liver break down the carotenoids into the pink and orange molecules and then these pigments are deposited in feathers, legs and beaks. 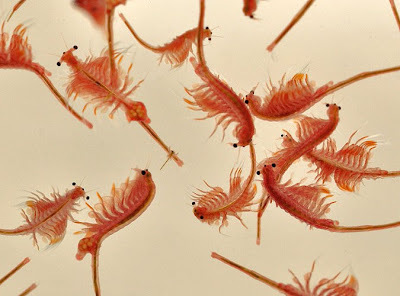 The beta-carotene in the brine shrimp is the same chemical that makes carrots orange, and is very important because is the building block that, for instance, we humans need to manufacturate vitamin A, like flamingos do. 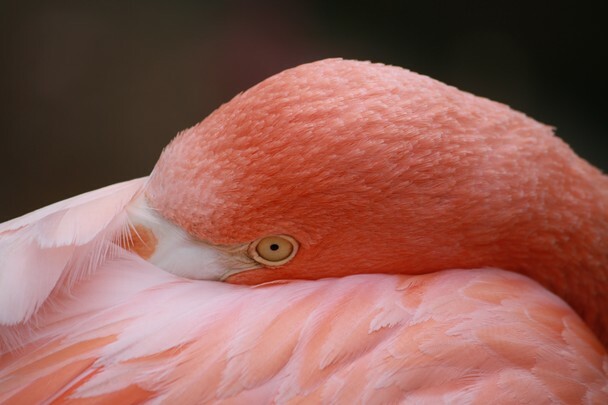 Captive flamingos are feed a special diet that includes prawns - a pigmented crustacean - or additives such as beta-carotene or canthaxanthin in order to maintain the vibrant pink colour. Why is this so important? Because the colour plays a key role in mating: the deeper the pink color is, the more attractive the bird will be. If the flamingo's feathers are coloured and brilliant it will mean that the animal is healthy and a great choice to mate with. Flamingos also use their uropigial glands to make up their feathers. As all the birds do, they produce oil in glands near their tails: it improves the longevity of the feathers and keep them waterproof. Flamingos daub this oil onto their feathers with their beaks. The oil is also rich in carotenoids and both males and females flamingos increase their oil-daubing behaviour during the mating season, trying to be as pink as possible!